A smaller home doesn’t mean you have to compromise on a good design! 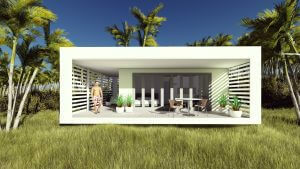 Lifestyle is enhanced through a home that offers a private and peaceful setting to feel relaxed in. Lots of outdoor space, natural light and breezes; a place that gives you a good quality of living, without the financial stress of a large mortgage. Whether you plan on living in the new home, renting it, or providing it for family members, its occupiers crave a happy and healthy lifestyle. Live bigger through good design aims to fulfil this natural human need. Consider WHO will be living in the Shack, and how it will be USED, to make sure you pick the right size and internal layout that will suit its occupiers. In a small home look for higher ceilings, open plan design, lots of windows and outdoor space. Also look for smart ways to create space for storage. Our ceilings are either raked (in line with the pitch of the roof) or at a minimum height of 2700mm for extra high ceilings and space. What home style do you love? A beautifully designed space provides a place you want to come home to, invite friends to, and feel proud of! What style will enhance your property and maximise its value into the future? Check out our build tool to find the perfect Funky Little Shack for your lifestyle. 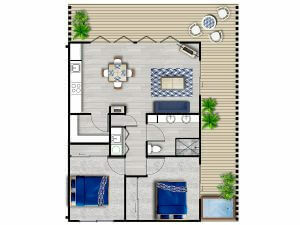 Let our team help you create granny flat designs for Brisbane and beyond.